By Chris Williams: Michael Koncz, the adviser for Manny Pacquiao, will be bringing 32-year-old Kendall Holt into camp to help Pacquiao with sparring to get him fine-tuned for his fight with WBO welterweight champion Tim Bradley (31-0, 12 KO’s) on April 12th. Holt will be helping out once Pacquiao hits LA to start training at his trainer Freddie Roach’s Wild Card Gym. It’s unclear who’s idea it was to use Holt. If it was Koncz’s idea then I think Roach needs to be a little more involved in the selection process for the sparring partner. Holt is kind of up there in age, and he’s not someone that fights anything like Bradley. What you don’t want to see is Holt getting a job sparring with Manny based on the fact that he fought Bradley five years ago and lost a 12 round unanimous decision to him. If that’s the criteria for hiring sparring partners for Pacquiao, then they need to drag in former Bradley victims Joel Casamayor, Devon Alexander, Luis Carlos Abregu, Lamont Peterson and Ruslan Provodnikov to try and help Pacquiao get ready for this fight. 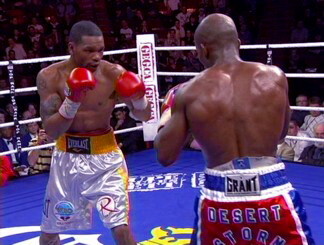 Holt knocked Bradley down a couple of times in their 2009 fight, but they were both flash knockdowns where Bradley got hit with shots that he didn’t see due to him fighting in a sloppy manner. If Bradley fights Pacquiao like he did Holt, he’ll get knocked out for sure. Bradley won’t do that, because he’s learned his lesson from the beating he took against Provodnikov, and he’s not going to take a risk that Pacquiao hits him with something that he doesn’t see. Bradley is going to play it safe by moving on the outside and throwing a lot of jabs to Paquiao’s midsection while trying to stay as far away as possible. Bradley likes to throw a lot of jabs to the midsection for some reason. Pacquiao needs to plan for this because he can take advantage of it by nailing him with some big shots when Bradley does this. Holt isn’t a great mover at this point in his career, and I’m not sure if he’ll be any use at all in mimicking the fighting style that Bradley uses. If it looks like he’s not able to copy Bradley;s style, then they need to dump him and get a sparring partner that is more similar to Bradley.